Description: This rare animal is white or pale brown in colour and is often tinged with a purple hue. Small specks of brown pigment cover the mantle. The mantle bears many small rounded tubercles. The rhinophores bear about 14 close-set lamellae and there are ten gills. The largest specimen recorded was 12mm in length. Habitat: Alder & Hancock collected the original two specimens on the bryozoan Cellepora pumicosa "from the deep water fishing boats". O. inconspicua was subsequently reported to feed on Cellaria sinuosa by Miller. Chris Todd found several specimens at Robin Hood's Bay and these were feeding on Cellepora pumicosa and Porella concinna, so Miller's report of the food must be considered doubtful. The similar species Onchidoris oblonga does feed on Cellaria sinuosa. The spawn is a neatly coiled thin string of eggs. Distribution: Records of this species are few, originally from off Northumberland and more recently from Robin Hood's Bay in the North Sea, Normandy and Brittany. The specimen illustrated here is from Gulen, north of Bergen in Norway. 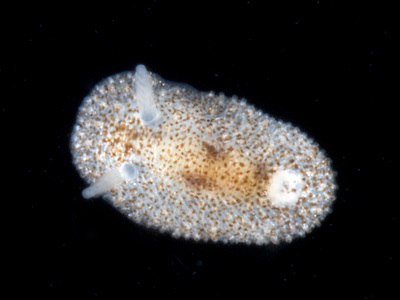 Similar Species: Onchidoris sparsa also feeds on Cellepora pumicosa and is similar in colour. However it can be distinguished by having only 8 or 9 rather distant lamellae on the rhinophores and a conspicuous pattern of larger tubercles around the bases of the rhinophores. White animal with irregular spots of purple, brown and yellow. Picton, B.E. & Morrow, C.C. (2016). 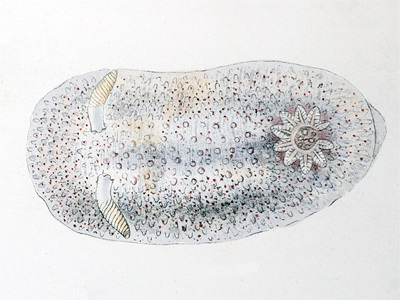 Onchidoris inconspicua (Alder & Hancock, 1851). [In] Encyclopedia of Marine Life of Britain and Ireland.